And, remember, understanding the joint structure and muscles of your hip will make you a better sequencer! When you’re aware of all the muscles that comprise your hip, you can make sure that your sequences target all of the muscular compartments instead of focusing too heavily on the outer-hips and hamstrings like I did for so many years! Quick caveat: I’m going to describe the muscular compartments of your hip as though they are each separate and solitary. I’m doing this because it provides us with a simple, foundational “map” of the hip muscles and their functions. In reality, there’s a lot of crossover between the muscular compartments. The compartments often help each other out and work together. For example, the adductors–especially the adductor magnus–assists the hip-flexors. Similarly, your external rotators often work with your abductors to adduct your hip. So, as you learn these compartments, keep your understanding basic and simple. But, remember that these muscle groups are often helping each other out. 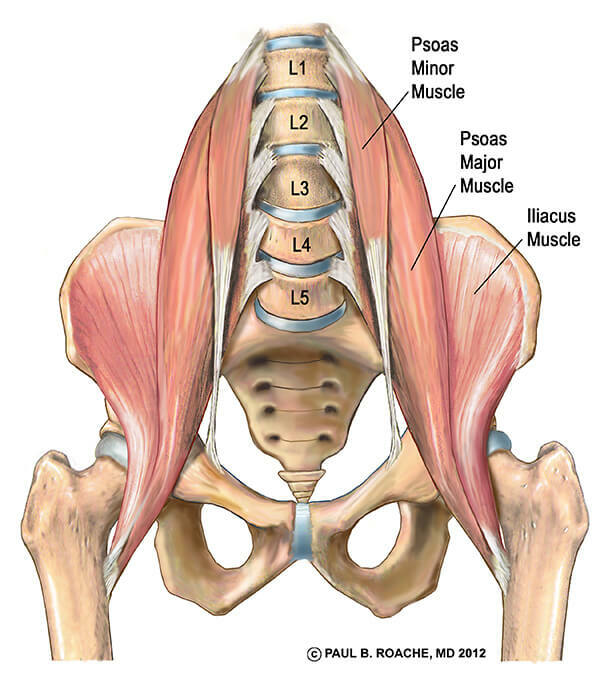 Hip Flexors: Your hip flexors in include the psoas, illiacus, and rectus femoris. These muscles connect the front of your pelvis to the front of your thigh (the psoas also connects to your spine). In simple terms, these muscles rotate the front of your pelvis and the front of your thighs toward each other. They are actively contracted in forward bends and core-focused work. The hip-flexors are often the most limiting factor in yoga backbends. If your hip-flexors or tight, they will inhibit your pelvis from rotating backward over the femurs. This often requires the lower back to extend too much and become overly compressed. 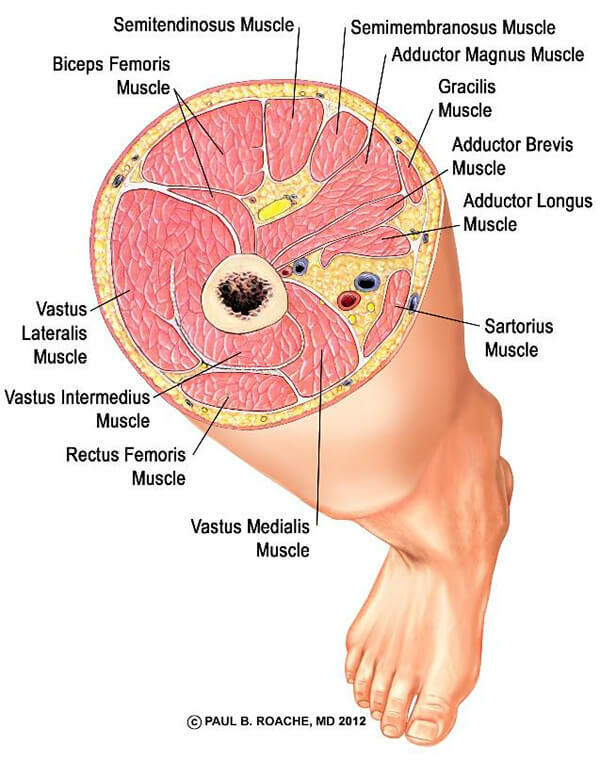 Adductors: Your five adductors run from your pelvis (pubic rami) down the inside of your leg. Only one of them, your gracilis, crosses your knee. In yoga, these muscles limit postures that require your thighs to separate widely such as Baddha Konasana and Upavistha Konasana. All of the wide-legged standing postures like Warrior II, Triangle Pose, and Side Angle Pose do a good job of creating range of motion in this group. The adductors are strengthened in core-focused work. Hamstrings: Yes, your hamstrings are hip muscles! Your hamstrings attach to the back of your pelvis (ischial tuberosity) and run down the back of your leg. Their job is to extend your hip and flex your knee. It’s obvious that hamstring restriction limits forward bends because it keeps your pelvis from rotating forward in these postures. What’s less obvious is the role that these muscles play in backbends. Contracting your hamstrings in backbends helps rotate your pelvis backward over your thighs. This allows your spine to move more deeply—and more comfortably—into backbends. External Rotators: Beneath your gluteus maximus, your six external rotators run from your pelvis to your thigh bone. The most familiar name in this group is the piriformis. 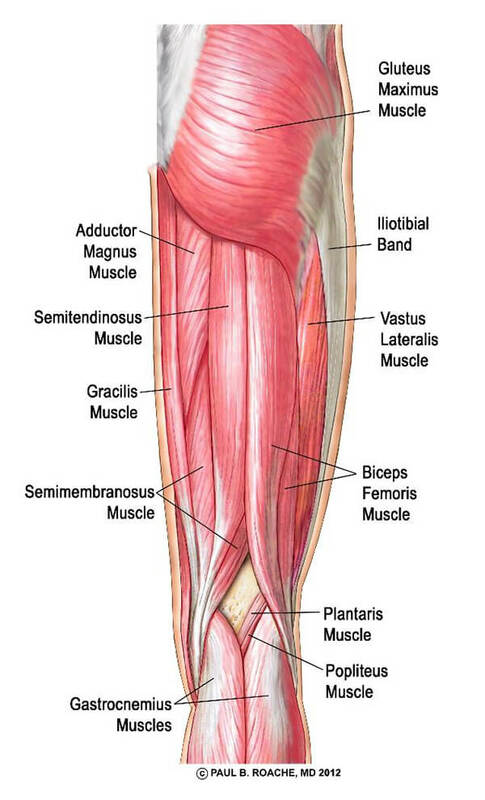 As the name implies, these muscles primarily rotate the thigh bone laterally. The external rotators are the main muscles that most students feel when they do Pigeon Pose, Cross-Legged Forward Bend, and Ankle-to-Knee Pose. Restriction in your external rotators makes it difficult to sit cross-legged and can reduce your ability to do forward bends and seated twists. Strengthening this muscle group can help keep your sacroilliac region stable and maintain optimal alignment in this joint. 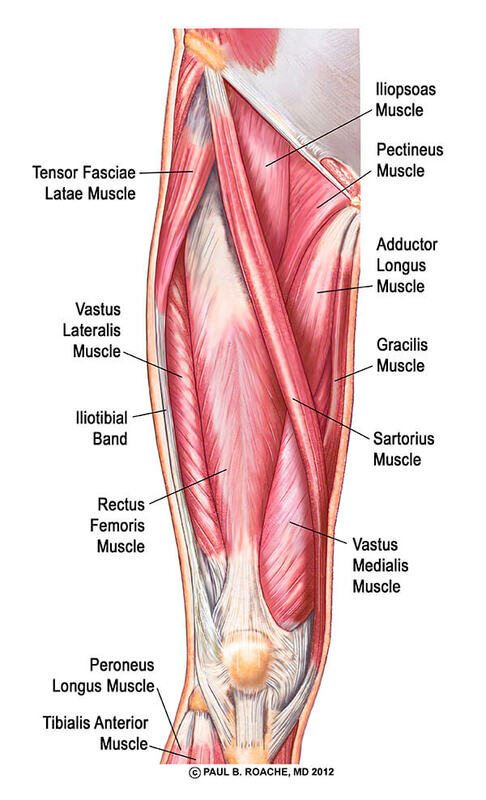 Abductors: Your abductors include your entire gluteal family (maximus, medius, & minimus), tensor fasciae latae and sartorius. These muscles run from the outside of your pelvis to the outside of your thighbone. When they contract, they either stabilize your pelvis, or pull your thighbone out to the side. Although they derive their name, “abductors,” from the latter (to take away), they’re usually working to keep your pelvis stable while you stand and walk. Outer hip openers like Pigeon and Gomukhasana stretch this muscle group. Standing postures—especially the top leg in Ardha Chandrasana—strengthen this group. This drawing illustrates the pathway of your psoas. Ignore the fact that “major” and “minor” are both listed. These muscles contract strongly in postures like navasana and bakasana. They stretch in all of your backbends and lunges. The rectus femoris is a “double-duty” muscle. It works with the other quadriceps (technically, it is considered one of the four quads) to straighten the knee. And, it works with the other hip flexors to flex the hip. Like the psoas and iliacus, the rectus femoris strongly contracts in most core strengthening postures and lengthens in all backbends. I included this illustration in my Illustrated Guide to Yoga and Your Core due to the adductors relationship to the core. Check it out here if you haven’t read it. This 3-D cutaway shows the adductors running between your hamstrings on the back and your quads in the front. You contract your adductors in core-strengthening work and you stretch them in all the postures where you separate your thighbones such as Bound Angle Pose, Malasana, and most standing postures. 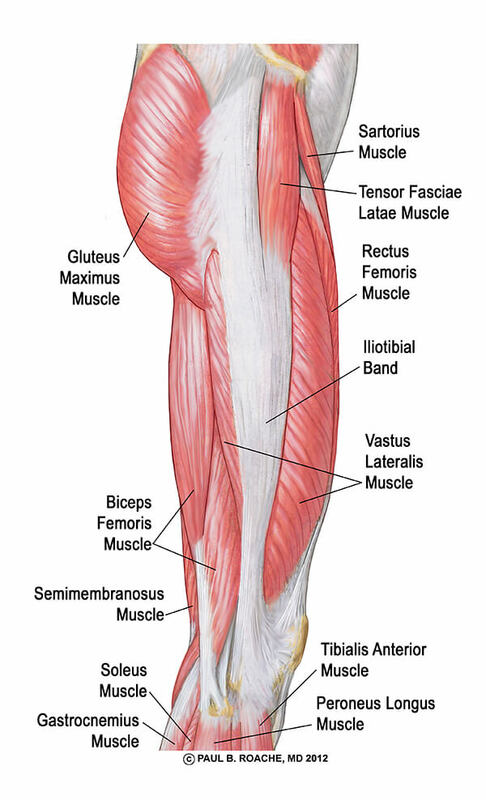 Your hamstrings include the semimembranosus, semitendinosus, and biceps femoris. You strengthen your hamstrings in backbends, especially prone backbends like Locust and Bow. You stretch your hamstrings in countless postures, including all standing forward bends and all straight-leg seated forward bends. This is my favorite illustration in this series. The left side shows the gluteus maximus. On the right side, the gluteus maximus is removed from the illustration revealing the external rotators that live underneath the gluteus maximus. You can see how layered and dense this region is. You strengthen your external rotators by engaging them in standing postures and backbends. You also strengthen them in some of the transitions between postures in vinaysa yoga. You stretch these muscle groups in all Pigeon Pose variations and cross-legged forward bend variations. 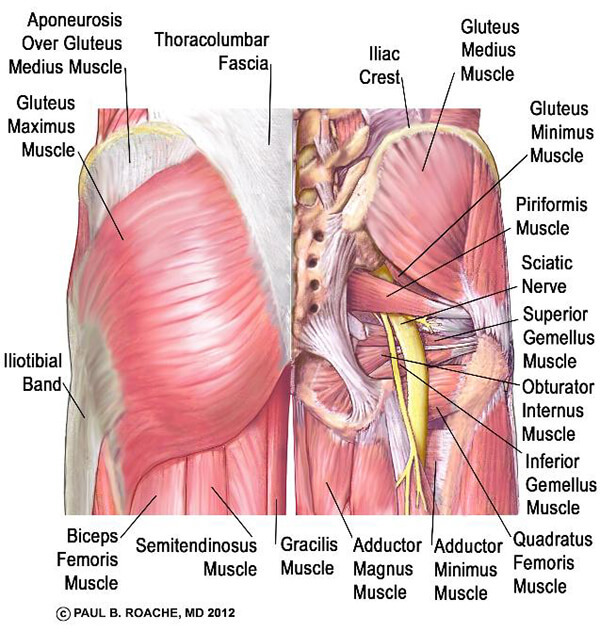 You can see your glutes, tensor fasciae latae, and sartorius in this illustration. In yoga, we have to make a concerted effort to strengthen these muscles since they don’t automatically engage in most postures except for standing balances. In Part III of this series, I’ll provide you with some cues that will help you work these muscles. You stretch these muscles in all outer-hip openers, like Gomukhasana and Pigeon. Thanks again for checking out this series! Be sure to keep in touch with me by signing up for our newsletter! These are such great summaries. As a new teacher who is very curious about anatomy, they’re so helpful! I’m curious, and realize this could be a number of different things, but why might a student be fairly flexibly in butterfly but then really struggle with upavista konasana? Would it be due to the gracilis? Thanks for reading these articles, Jess. It’s always tough to answer questions without seeing the student’s posture. But, the biggest difference in these two postures is that upa vista konasana stretches the hamstrings and butterfly does not. So, it’s most likely a hamstring issue. Check your student in other straight-leg forward bends and see what you think. These articles on your blog are a great adjunct to the Sequencing Course. I have built a binder for the course and these materials enrich it greatly. The Sequencing Course has really helped me grow and improve my classes in my fifth year as a teacher. I would recommend it highly. Thanks, Russ! This is a really good idea. I love your blog! I received my RYT 200 this year, something I’ve wanted to do for a very long time, and now I’m continuing my education with workshops, etc. with a great focus on anatomy. your sequencing material has given me so much to incorporate and include in my teaching. Thank you so much … I will refer to your blog for as long as you have it and hope to joint some of your classes along the way as well. Thanks for your feedback, Bonnie! I’m glad the blog is treating you well and that it’s helpful for you and your students. I hope to see you in a workshop next year! 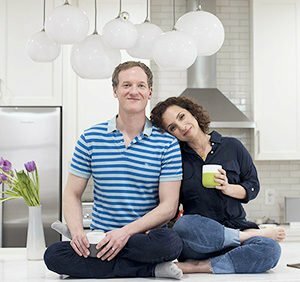 Another great article, thank you, Jason! I follow your blog with passion and always look forward to reading more. There is a minor typo in this one, I think: Glutes, TFL and Sartorius are abductors and not adductors. Apologies if I’m wrong. Thanks for reading our blog and catching this typo, Veronica! thank you so much for opening my mind! You’re welcome, Yvonne! Thanks for practicing with me! Following you from Spain…spreading the good of your teachings here. thanks for your insight in anatomy…so clearly and simply expossed. I feel safer about my teaching and I am really enjoying studing anatomy with you! Very motivating to improve in my sharing. Gracias!! Me and a group of fellow students are passionate about learning and understanding yoga and anatomy, your blog is such a great inspiration, I love your deep understanding and clear explanations, thank you sooo much, i will keep on following you as part of my essential readings! Thanks Paola! I really appreciate it! So sorry to hear about your struggles, Ray. You’re describing a somewhat common and very long-to-heal injury. Hang in there. I prefer not to discuss injuries in this forum because there’s no way of truly knowing what’s happening without proper diagnostics, but, yes, this could be an adductor, adductor tendon, hamstring (or all of the above) issue. I’d advise you to check out a good PT in your area! I thank you for the thorough detail and information that is available to me. 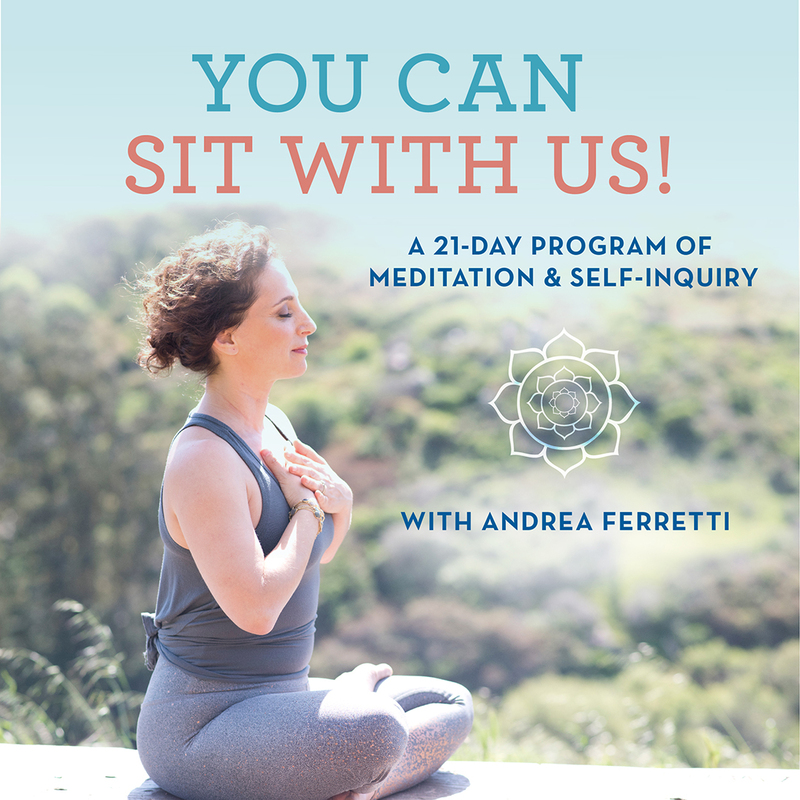 As a Yoga teacher and lifelong student, the content of your material has furthered my education. Thank you again for the material! LOVE LOVE LOVE your blog! Thank you so much for sharing your knowledge. Im really hoping you answer this question although I realize its an older post. I have a question about moving from internal hip rotation postures to external ones or vice versa. My understanding is that we really shouldn’t sequence classes like this bc of the long term damage it can do to the hip joint. So for example, NOT sequencing virabhadrasana III to ardha chandrasana bc of the intense rotation to the hip joint from bearing all of ones weight on the standing leg. However, what about parivrtta parsvakonasana to virabadrasana II? Does that depend on feet placement? Is it a true internal to external rotation? I know there are no absolutes and it can depend on other factors, but generally speaking, whats your take on this? I am deeply passionate about keeping my students safe and helping to develop sustainable yoga practices them as well as myself. Sorry for the long winded question.